Licensed in Curacao, Thunderbolt Casino is the latest casino to launch its services to South African players. Operated by Audeo NV, the casino has been certified by Technical Systems Testing (TST) as having a fair random number generator which means that players can rest assured that they stand a fair chance of winning some of the very impressive jackpots on offer, thanks to the games supplied by Real Time Gaming. The casino also stipulates that is uses the latest technology for public/private key encryption in order to protect player security. Thunderbolt Casino has a range of more than 300 games on offer thanks to RTG, including video slots, video poker machines and table games. Both experienced and new players will find games that meet their budgets, from blackjack and roulette to baccarat and more traditional slots. All games on offer can also be played in practice mode, so there is no need to bet on any games before you feel comfortable with their rules. As you may already know, if you have played at other RTG casinos, the games are all of exceptional quality and have some of the most impressive jackpots you’re likely to find when you play online. Some of the other bonuses and promotions you’ll want to keep your eye on include the weekend special bonus in which you could get a match bonus of over 100% on your deposit, Thundering Thursday in which you could net an extra 150% bonus depending on the size of your deposit, comp points, bonuses on new games and even a Tasty Tuesday bonus. 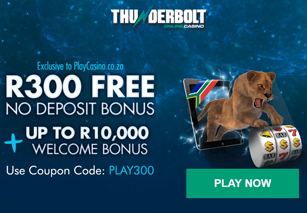 The list of bonuses and promotions offered by Thunderbolt Casino is actually astounding, and has to be one of the longest lists of promos offered by any South African online casinos out there. Even the best online casinos accepting rand (ZAR) can be let down by lacklustre customer support, but this is not the case for Thunderbolt Casino. If you pick up the phone, write an email or start a live chat, you’re likely to pick up quickly how good the support provided by Thunderbolt staff is and this is underpinned by the fact that the staff is reachable any time of the day or night, all year round. What makes the support even better is that you can talk to a consultant in your own language or if you’re on the shy side, you can simply read through the list of FAQs to find an answer to your burning question. All of the following payment methods are accepted: Visa, MasterCard, Skrill, SiD Instant EFT, EasyEFT, Eft (Standard Bank, Absa, Nedbank, FNB, Capitec), EcoPayz, Neteller. Thunderbolt’s live tournaments allow players to have a face-to-face (well, computer-to-computer) battle where anyone could come out on top. For a small buy-in these tournaments give players a small pre-set line of credit and a time limit. Whoever tops the leaderboard at the end gets to keep the pot, but one of the special features that Thunderbolt Casino allows for is that players can give themselves a little extra edge by buying an “add on” for extra spins or time, or a “rebuy” which lets them restart the tournament in an effort to get a better score. Once all of the players are done, the winner gets the cash. If you’re ready to start having a great time and want the opportunity to win loads of cash, you have three gaming options available to you at Thunderbolt Casino. The first is the instant play Flash casino which allows you to play games in your browser. There is no need to download the casino or save any games on your hard drive. However, if you want more of a range of games, the download casino can offer you that. The software is fully certified and by saving the casino onto your computer, you can quickly and easily download only the games you want to play onto your desktop. If you’re a busy individual, as so many of us are, why not take your games on the move with the mobile casino? Thunderbolt Casino is available on Android and iOS, which means that with your smartphone or tablet, you could play off the mobi site within seconds. If we were to sum up Thunderbolt Casino in one word, that word would be: exciting. This is a casino that has lists of bonuses and promotions as long as your arm, which means in addition to offering the same brilliant games, functionality and jackpots that other casinos do, it goes the extra mile. And isn’t that what every player really wants from their South African online casino?